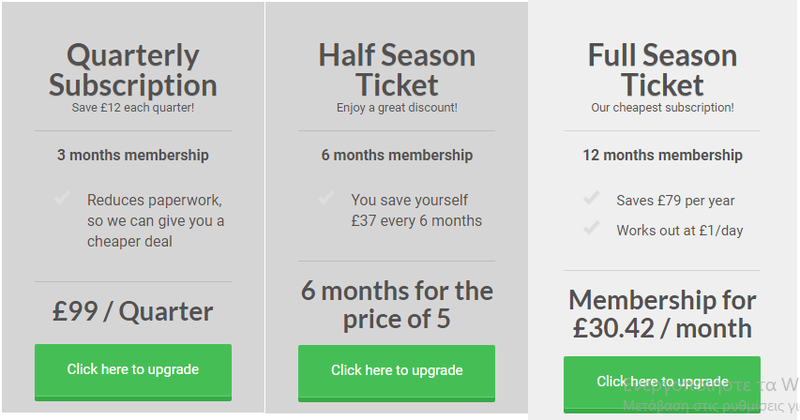 Goalprofits is a community for football traders, focusing on helping members learn how to trade the betfair football markets. It a monthly subscription service and members are getting access to trading strategies, trading selections, statistics and other useful features. It is not a tipping service but its based on team stats to try to find an edge on the betfair betting markets. The site has been online since 2011 and has been evolved as one of the best trading communities online having won many awards. GP basics. Discover what to expect in the Goalprofits Members Area, including Team Statistics and chat room. There is also a series of FAQs and a glossary of terms often used by members. Trading basics. You will find a series of articles which take you through all aspects of football trading. Weekly module. Once you have completed the Trading Basics section, click on ‘Week 1’ which will introduce you to your first trading strategies. There are 16 weekly module and you can work on them at your own pace. Orbit. This is a step on from Launchpad, aimed at members whose trading portfolio is ticking over and nicely in profit. Topics covered include psychology of trading, trading styles and financial freedom. Currently, there are 16 strategies available to members. That includes first half, second half, full match and correct score strategies. The strategies are all introduced one by one in Launchpad. Every strategy has a quick guide and on some of them, you will find explanatory videos. Also, on every strategy, you will find shortlisted a selection of games from the team statistics. The majority of them are not straight betting and require getting into a trade once certain conditions are met. As we have seen before Goalprofirs has been online since 2012. Throughout the years’ many strategies have been developed and some of them have been replaced or removed. 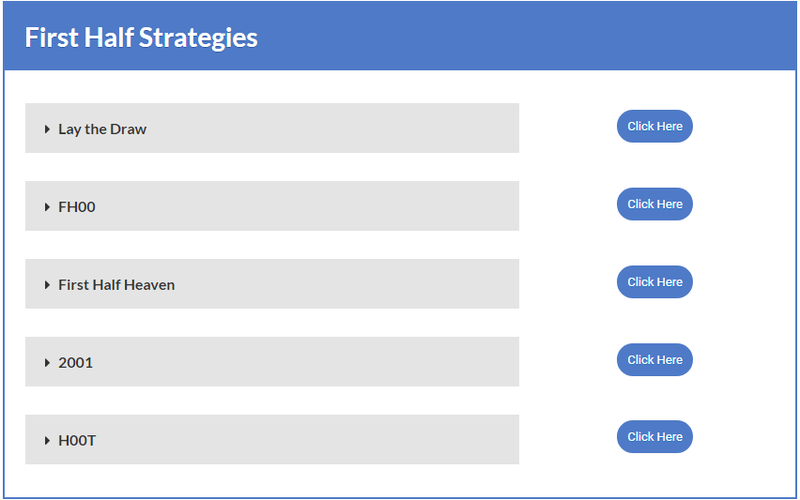 They are listed on a section of the site called strategy graveyard. You will still have access the guides of those strategies and the shortlisted stats. So you can say that there are a lot more than the 16 core strategies. It’s worth joining Goalprofits only for the team stats software. If you are a statistics guy then you are in the right place. I haven’t found any other site online to have the amount of stats that Goalprofits provides as it covers every team in 65 leagues worldwide. In the “Main Team Stats Pages” section you can find the most important stats of every fixture. You can get form pages covering the last 5,10 or 15 last games and a tool to compare random teams which is especially useful for cup matches. Except from the main stats, there are other pages covering corners, shots, cards, referees and many other stats. 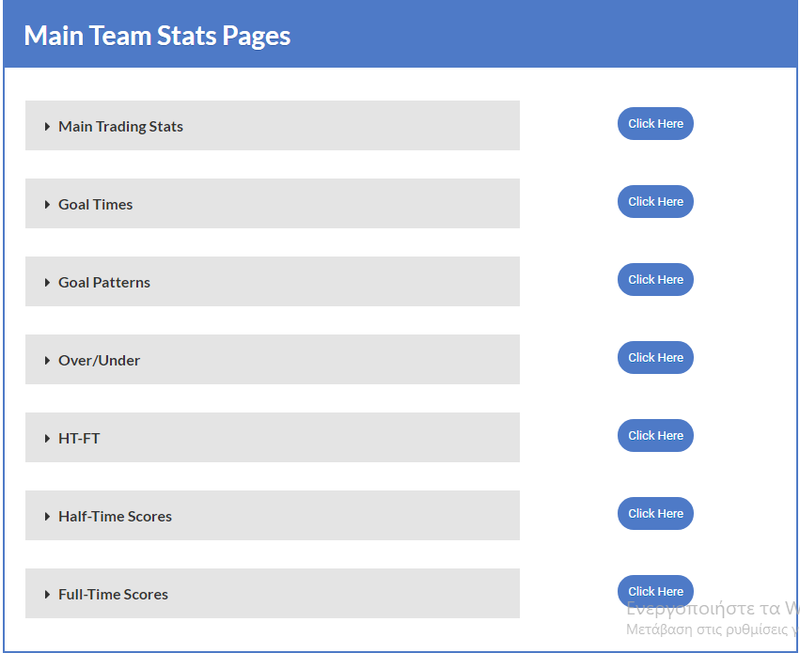 One other tool is the Team Statistics Trends which will help you identify long-term trends in leagues covered by Team Stats (ten years of data for each league) Once you know how leagues are performing against previous seasons you may be able to find some trading opportunities at that leagues. The latest addition to Team Statistics is the League Table Analysis (LTA). This page identifies strong opportunities very quickly, by showing you whether teams are higher or lower in various league tables than their overall league position. For example, you may find a home team which is much higher in the home and second half tables playing a team lower in the away and second half tables. This would be an obvious fixture for further research and, perhaps, a second half trade – especially if the half-time score is level. Here you can find 20+ league tables for all 65 leagues covered. Finally, there are the LTA shortlist and the strategy shortlist where all the fixtures that met the strategy criteria are listed. Of course, you can easily create your own shortlists and save them. With that feature, you can do your own trade research with the stats you want and even create some strategies from yourself. The chat room is where you can trade live among with other Goalprofits members. Both Kevin and Steve (the admins) trade live in the chat room, alongside members. The days that they will be active are announced in the members’ panel. Also, there’s a forum available which has lots of questions, answers, ideas and trading diaries. Goalprofits members enjoy a very high level of support. Both Steve and Kevin respond to every single email they receive and no-one is ever left to fend for themselves. One other great feature is the live trading module (LTM). The LTM tracks all in-play games covered by Team Stats. In addition, the Live Trading Module tracks in-play stats for internationals and many cup competitions including the FA Cup, Champions League and Europa League. This opens up many more trading opportunities. Shots inside the penalty area. Shots outside the penalty area. Alerts. This column shows you which Goalprofits strategies the game currently qualifies for. It also displays the amount of added time at the end of the first and second half. If you click on any league name, the league table will be displayed. If you click on any team name, you will see the Team Stats scores table. The checkbox next to each fixture adds it to “My Games”. Finally, you can find information about the weather, pitch condition, temperature and wind. Members strategies. Systems developed form other members of the site, using the Team Stats software. The cost is around 10 GBP per month. Scalping mode. Pre-match scalping is a very effective form of trading. If you are able to anticipate price movements, you can bank profits before the kick-off. The software shows the price movements 6 hours prior to kick-off at the match odds, O/U 2.5 goals and some correct score markets. You will also get access to some strategies created by Kevin. The cost is around 10 GBP per month. Team stats excel. Team Statistics Excel pre and post-match data spreadsheets are available for less than 17p per day each. Trade your bets. Trade Your Bets (TYB) is the sister site to Goalprofits. It employs a complex “Value Trades” algorithm in order to identify opportunities for Home Win, Over 2.5 Goals and Both Teams to Score trades. The cost is around 20 GBP per month. As you may have understood I am a big fan of the Goalprofits site and especially the Team Stats tool. Goalprofits is a comprehensive product that is always evolving and new features are continuously added. If you want to become a successful betfair trader Goalprofits would be a right fit. I strongly suggest this service for everyone who wants to put the extra work needed to become a betfair trader. Oddstorm review - The fastest surebet scanner!